Clinton County Commissioner Mike McCarty will join a committee to explore two proposed recreation-and-wellness facilities in the county, and is expected to update the other county commissioners on the committee’s direction. 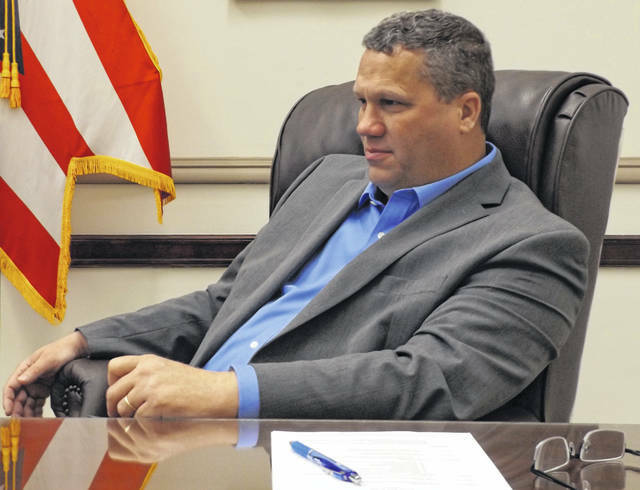 WILMINGTON — Clinton County Commissioner Mike McCarty was appointed by his fellow commissioners Monday to a committee to further explore two proposed recreation-and-wellness facilities. The action is in response to a request made last week at a public presentation that a commissioner become a member of the committee. The presentation summarized the results of a feasibility study for a proposed Recreation & Wellness Center in Wilmington. Of interest Monday was the plural wording used by commissioners to describe the committee: an exploratory committee of future health and wellness centers. During last week’s presentation, facilitator and local attorney William “Bill” Peelle said in his opinion both the proposed Recreation & Wellness Center in Wilmington and a proposed Blanchester Pool & Recreation Center can be successful, adding that supporters of the two projects can rally around one another. Attending the commissioners’ vote to appoint McCarty was Clinton County Regional Planning Commission (RPC) Executive Director Taylor Stuckert. The RPC helped develop the feasibility study for the proposed Recreation & Wellness Center in Wilmington, along with PROS Consulting, based in Indianapolis, Indiana. Stuckert told commissioners the timeline goal of the recreation and wellness centers committee is to move pretty quickly through April and May and then it hopes to have something to share with commissioners in June in terms of concrete plans and suggestions. The goal of early summer, said Stuckert, was set in case there’s something to put on the fall ballot which would have to be done by a board of elections’ August deadline. Also Monday at the commissioners office, McCarty reported on his attendance at the most recent Clinton County Port Authority meeting. He related that Amazon’s construction project to open an Amazon air gateway at the Wilmington Air Park this summer remains on track. Though the Port Authority — which owns the air park — is running out of space to lease there, there are “a number of people interested in different [business] things” for the location, McCarty said, but due to confidentiality the Port can’t talk about it. “There’s a lot of interest in possibilities out there,” the commissioner reiterated. As a result of the March 14 wind storm that rolled through the Clinton and Fayette Counties area, there was a loss of power at the air park plus substantial damage to the roof of the JUMP aircraft maintenance hangar that AMES operates. In addition, the winds led to a loss of fence at the air park, reported McCarty. The problem with fencing was addressed immediately, he said. In his report, McCarty said he wanted to alleviate some confusion that’s arisen after the county commissioners office recently sent out correspondence related to updating its list of people interested in serving on various county boards. Some recipients thought the mailing meant commissioners were looking at changing the makeup of the county boards, so McCarty said he wants to assure them it was simply an effort to see who wants to remain in the pool of interested people to serve as volunteers on boards which periodically have vacancies arise.